3. « The E’ye project: What is art ? 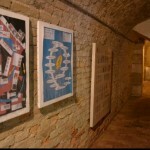 » What is the role of the Art ? And consequently the role of the Artist ? It is necessary to say that from historic point of view, the XXth century was an incredible explosion of permanent novelty. We can not count the movements and groups of artists. Meanwhile, I was not discouraged. I continued my quest on the “new”, while knowing that the “new” raises problem, because it confuses the audience. Then, how can it be done ? Always pursue. Live with this appearance. I spoke in the singular, but in reality, we must speak in the plural. It is often a “family of appearance.” I thus found, for example, by moving in a given system [A], an element, we obtain a new system [B]. Saving you important details (the value of cinema and cinematic vision. – And therefore the movement.) We arrive at the “Project e”. So for example, in the beginning, the letter “e” in the title “project e” was a word of 5 letters. I hid 4 letters, by keeping only the first letter, to obtain the “Project e”. And suddenly, I got “something else”, something unexpected. In short this “gymnastics” of “the something else” is going to give, in part, what we have in front of us. As I have just said it, “the something else” began to generate a dynamics (horizontal and vertical) unexpected and unpredictable that it was important to take into consideration. 1. The “E’ntraînement” (Training) project, an association between the art, the martial arts and the religion. The idea was to train, unexpectedly, on a Saturday afternoon, a voluntary public in a city center. 2. The “Ouvertur’E” (Opening) project. Pass (as not telling to give) a work during an exhibition of drawings to passing visitors. There were 42 drawings that were given. 3. E’nvoi (Sending) project: the gift of a work of art in a single click. In summary, the “new” consists in not making as the others. 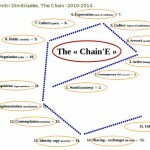 If I consider the « Chain’e » of the Equation data on art. It is enough to make a change inside the chain and we end up with the a new data. 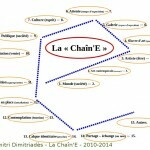 The « Chain’e » is a great opportunity to introduce the second point of my statement: The question of the “Whole”. We note that inside the answer of Deleuze, we obtain a significant relationship between the “whole” and the “new”: it is from a whole, or from its approach, that we can see arise something new. So when I say “everything”, it is about an extension of a globalizing panoramic projection. To illustrate this idea, I will tell a little story, and I quote again, depending on the circumstances in front my students : A work of art today must contain both the Old and New Testament, the Iliad and the Odyssey, as well as other cultural monuments. And in fact, if we look at the “Project E’ye: What is Art ?” We obtain an explicit example of what I just said. It contains both the Old and New Testament, the Iliad and the Odyssey, as well as monuments of universal art. Initially, I noticed that it was difficult to speak about a work in front of students without indicating it. The frieze allowed me to jump up, at any time on a given work (I did not need to look and to take out a board …) The work is there, it was exposed. We can pull a first observation. The difference between speaking about a work and showing it. This quality is visible in the Project E’ye . A second observation was to demonstrate to students that art does not go back up to the dawn of time (at least according to our current knowledge, which remain still hypothetical). On the scale of the age of the planet, art is relatively young. The current European climate: 80,000 years. The art therefore does not appear until the third millennium in the West (fifth in China). The beginnings of art were only possible from a certain mastery of domestic life. It was necessary to find accommodation at first, to feed, etc. But you can see immediately, that for housing, food and drink, art is already present, there was from the beginning an intimate association between art and the birth of humanity. The current climate goes back to the eighth millennium. It took almost 50,000 years before seeing the hatching of an artistic spirit which tries to produce original objects. In short there was originally a magical relationship between works and people which in some way disappeared. To summarize, there has not been a “big bang” of the art world. There have been sporadic and scattered sparks in northern Europe. The real art outbreaks will take hold from a necessary condition: the sweetness of a temperate climate : Egypt, Mesopotamia, the Cyclades, Greece, Italy. Thus, the warmth of these regions reflect the incandescent heat of the arts. It is then necessary to imagine the exceptional exploit of these men who had to, ceaselessly, invent the whole artistic universe. Human beings extra or extra-human beings. I realized, too, that it was important to show that work to the greatest number, that it was a part of my artist’s role, to draw the attention of the people on the art and the major works of Art. 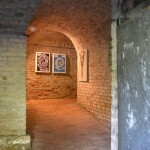 I decided in 2012, to consider the whole artistic world as a ” object of reflection “, to work the thickness of the art. But, I did not want to make a work of documentation which remains a little bit cold for me. At the same time, I began to be interested in diamond shape. It was enough to add a horizontal bar to the upper level of a rhombus to suggest the shape of a diamond. There (with diamond format), I was convinced between the shape of the support and the artistic background which is a treasure : Art is as precious as a diamond. This I also wanted to show it to people. Then, there was the problem of the parts numbers (works). I took back the 8 components of an upper-case E.
My concern was always to show a selection of works from the origins until our days. I must point out that for the frieze in the college, I already had a list of 136 masterpieces. However, I found that for the first series of 16 pieces, it was not possible to cite the major disciplines of the arts: painting, architecture, sculpture, etc. I decided for the first series to include only painting, performing as much as possible, a mathematical distribution which includes 30,000 years of art history. We have not seen the synthesis of this accumulation of cultural wealth. Let us try to launch a qualifier in our present time, by taking into account what I have just said : I risk with “a new economic spirit “. The economy dominates the world : it is the law of the market, the offer and the demand, the production and the consumption, etc. This last idea contradicts a preconceived idea in our society. “Always do things profitable “, things which “bring back”. You go to tell me, but for a winemaker, a farmer, a pharmacist, in these trades it is not possible to allow this kind of digression. In this regard, I would say that Fleming find penicillin inadvertently (he was brilliant, but neglecting), Columbus, the push of Archimedes, they made “something else”, they noticed “something else”. Image-Mouvement, pp. 19-22 – Quoted also in my thesis. p. 3.